Details:Title: 老表,你好Hea! / Lo Biu Nei Ho Hea! 27 Oct – Wong Cho Lam may have had a sleeper hit through "Inbound Troubles" last year, but the comic actor admitted that he is worried that the ratings of the series' second instalment, "Come On, Cousin", will not be able to do as well as its predecessor. According to HK Channel, the actor, who also wrote the script for the series, stated that the ongoing Occupy Central may have something to do with it. "Everyone is paying attention to the news right now, so obviously the viewership ratings would be affected," said Wong. However, Wong, who also enlisted the help of "The Greed of Man" scriptwriter Lun Man Hong to create the perfect script, said that he has tried his best and hopes that the viewers will notice the effort made by the cast and crew. "The show is quite ironic at the moment. When I was filming the first series last year, I realised the division of Hong Kong people. But I didn't think it would have developed into this rapidly," he said. Wong also hopes that "Come On, Cousin" will become one of TVB's classics in years to come. class="headline" style="margin: 0px 0px 10px; padding: 0px; font-size: 26px; line-height: 1.21em; font-family: arial, helvetica, clean, sans-serif; background-color: rgb(255, 255, 255);"No third installment for "Inbound Troubles"
1 Nov – Wong Cho Lam recently revealed that there is no plan for him to write the third installment of the "Inbound Troubles" series. As reported on Mingpao News, the actor, who attended the promotional event of the second installment"Come on, Cousin!" in Yau Tong on 30 October, stated that he has not thought about making another season of the same thing. "I think that's enough for now. I want to move on and find other new topics to think about in my next work," he said. Meanwhile, Wong also dismissed rumors saying that he had a fall out with co-star Roger Kwok on the set of the series. "Roger is very supportive of me. We even talked about working together again in another drama after this." On the issue of "Come On, Cousin" using the theme song of ATV's hit series "My Date with a Vampire" in one of the scenes, Wong said that TVB has no qualms about it, since co-star Joey Meng was also from the rival station. Netizens strongly request Ram Tseung to return to the music industry after his performance on "Come on, Cousin"
TVB Anniversary series, "Come On, Cousin" produced a "black horse", Ram Tseung with his appearance in the drama. The night before, he and his golden partner, Rita Carpio, sang their golden song "Meeting Now, Need We Have Known Each Other Before? (相逢何必曾相識)", and even parodied a comedic version of the song "Meeting Now, Need We Have Burned Offerings? (相逢何必曾燒衣)" (T/N: Burn offerings as in burning paper "clothes" in funerals) The performance was highly praised by netizens. Approximately 300,000 netizens "liked" and requested Ram Tseung to return to the music industry again. After TVB drama "Inbound Troubles" successfully rose Ivana Wong and Louis Cheung to fame, this time, in "Come On, Cousin", they continued to play with parodies, putting Ram Tseung in the spotlight. The night before, the drama aired its 12th episode. Ram Tseung, who has a great voice and plays a funeral worker in the drama, partnered up with his "best partner", Rita Carpio and performed the well-known golden song, "相逢何必曾相識". They even performed a funny parody of the song in the mourning hall called "相逢何必曾燒衣". Along with the changed lyrics that match "funerals" so well, many were very impressed and gave high praises. Fans created a fan page for Ram Tseung "Save the Music Industry - Support Ram Tseung to be a singer again". The video clip of the song even attracted 300,000 likes in 24 hours. Other than becoming popular online, Ram Tseung even helped raise the ratings of "Come On, Cousin". Although the episode only had an average of 25 PTS, once Ram Tseung appeared and sang his duet with Rita Carpio, the ratings raised to 26 PTS. Afterwards, when Ram parodied the song, "相逢何必曾燒衣", the ratings raised once more to 27 PTS. In the end, when he and "wife", Rita Carpio, exchanged an emotional conversation in the park between the worlds of life and death, the ratings peaked at 28 PTS. In the 80's and 90's, when Ram Tseung was active in the music industry, he was actually a singer-songwriter who had both the looks and the talent. In 1990, he composed the golden song "Meeting Now, Need We Have Known Each Other Before? (相逢何必曾相識)" and won a lot of awards with duet partner, Rita Carpio. Although albums have become digitalized now, there are actually still gramophone records of the song available for sale. Unfortunately, after Ram turned to the television industry, he decided to stop singing, and even expressed he felt dispirited towards his singing career. Although there have been people who asked him to release albums, he refused. Regarding netizens strongly requesting him to return to the music industry, yesterday, when Ram Tseung accepted an interview, he said: "I won't sing again in the near future. Before, I did not see any improvement in my music, so I felt dispirited, but I have found some interest in it again recently! I will seriously consider it." Singing his golden song with good partner, Rita Carpio after so many years again, Ram also feels very touched: "Singing again with Rita Carpio after so many years, the feel is still there. But having her wait for so many years, I do feel apologetic." He revealed that he finished writing the parody of the song for the drama in half an hour: "Good thing the director did not film that fast that day. At the time, I used half an hour to fill in the lyrics. I am very happy that the result turned out so great." Performance Cut on "Come On, Cousin"
10 Nov – After singing a parody of his hit duet with Rita Carpio, "You Needn't Be Acquaintances to Meet with Each Other", on TVB's "Come on, Cousin! ", former '90s hit singer Ram Chiang recently found himself being the centre of attention again, On CC News reported. In "Come on, Cousin", Ram plays the role of former singer Ko Yum, a drunk that lives on the very top floor of a building and works as a musician at the local funeral home. He is also the original founder of "No Association To Music Ltd." record company. In one of the scenes of the 12th episode, the former singer sang the parody of the hit song during a funeral scene, entitled, "You Needn't Be Acquaintances to Burn Funeral Clothes". That particular scene had since turned viral in less than 24 hours, garnering new fans, with old ones urging him to make a music comeback. His appearance in the episode has also boost viewership ratings, from the average 25 to average 26 peaking at 28 points. 13 Nov – Former '90s top star Ram Chiang said that nothing much has changed since the parody funeral version of his hit song, "You Needn't Be Acquaintances to Meet with Each Other", turned viral recently, except that more people are starting to recognise him. According to Mingpao News, the singer-turned-actor, who sang the mock version of his old hit with Rita Carpio on the recent episode of TVB series, "Come On, Cousin! ", stated, "For me, everything remains the same, though there have been more job offers recently." Asked if his salary has increased due to the surge of popularity, Ram replied, "Not really. But more fans now recognise me on the street, and I feel like they see me as a friendly neighbour. This is what I want the most." On the topic of making a comeback in the music industry, Ram said, "People are still talking about it [the parody version], so I don't know. I will consider it after seeing the response when everything's calm again." "Singing is not a difficult thing for me," he said, adding that he has no qualms about participating in stage performances rather than rushing to release a new album. Filming of the series, Come On Cousin: Wong Cho Lam plans to release some artistes' secrets? Four days ago, Wong Cho Lam (王祖藍) attended the conference of the (HEA爆香港) concert and expressed that the performance will add some talkshow (棟篤唱) part or will expose artistes' secrets of the series, Come On, Cousin (老表，你好Hea！) He said: "Come On, Cousin has film 2 seasons, and there is many amusing scenes. very funny. Recently, the society needs more joy and hope to talk more about the happy matters, and make the audiences happy as well." 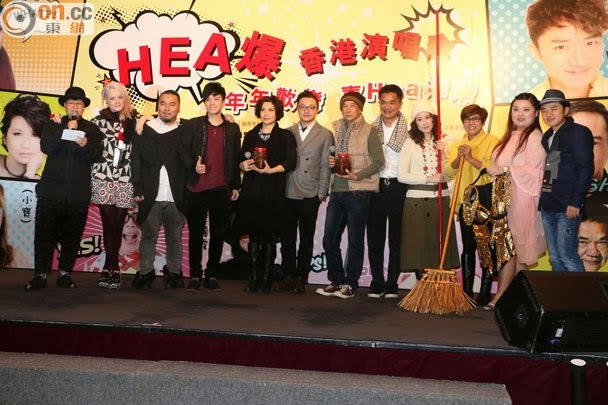 The cast of the series, Come On, Cousin (hea爆香港演唱會), attended the press conference of the concert for the series and this included Wong Cho Lam (王祖藍), Ivana Wong (王菀之), Corinna Chamberlain (陳明恩) and others. During the conference, Ivana created a joke that the pole will split if she performed pole dance and Cho Lam continued the joke as well. It caused laughter from the crowd instantly.